Every good idea starts somewhere. 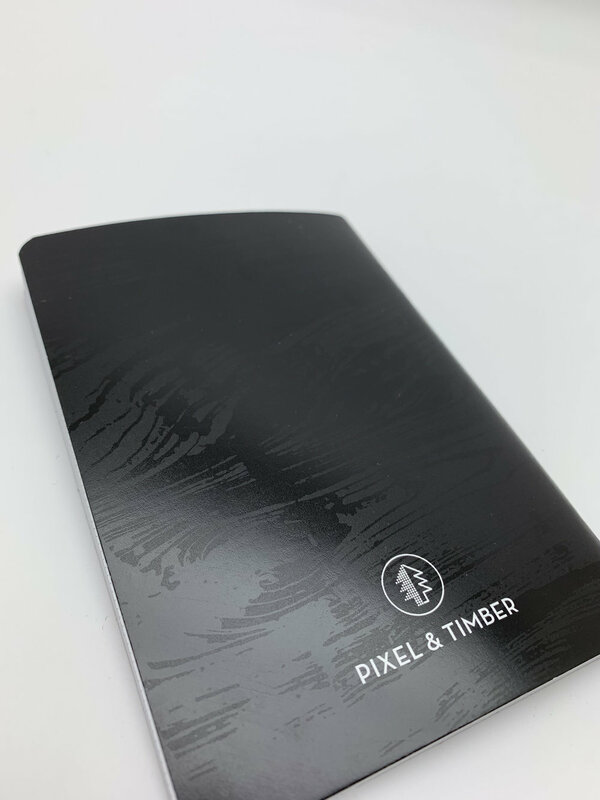 Once again, Pixel and Timber is offering a limited number of free pocket sketchbooks to our friends and colleagues. This “Series 2” sketchbook features cover art inspired by the catalpa wood grain of our “MegaDesk.” Use the form below to order yours — and continue scrolling to learn about the process behind its unique design. Thank you for your support! You should receive your sketchbook in about a week. These pocket sketchbooks were printed and bound by Jakprints, in Cleveland, OH. In addition to being fellow Ohioans, we love Jakprints for their dedication to environmentally friendly printing. Jakprints plants a tree with every order through Trees for the Future, and have planted or saved nearly 70,000 trees a year! Additionally, they are 100% wind powered, which is truly an awesome feat. The sketchbook covers are printed on a 12pt. gloss coat post-consumer recycled cardstock, with internal paper sourced from FSC certified forests, and all printing is done with vegetable-based inks. Each book contains 48 pages of 60lb. sketch paper — 12 more pages than Series 1! Finally, the beautiful “Strike-Thru Matte Varnish” effect you see on the cover is a more environmentally friendly process than typical “Spot UV” treatments to get the same gloss-on-matte results. This is the second in a series of pocket sketchbooks we’ve offered to our friends and colleagues — each with a unique cover design. The cover of this book was designed by our founding partner, Brandon Leedy. In August of 2018, Pixel And Timber acquired a striking, custom-built slab table from our friends and neighbors at Urban Timber. This giant table was crafted from a single 4 X 8 foot slab of catalpa, sealed with clear resin. Native to the US midwest, the catalpa is a large, fast-growing tree known for its shade-giving characteristics, its use in land reclamation, and as host for dozens of important species of pollinators, including the beautiful Sphinx Moth. We love the image of the catalpa as a meeting place and as the center of a community of natural “collaborators.” And for Pixel and Timber, that is exactly what this piece has become. Inspired by this newest member of the Pixel & Timber team, Brandon wanted to capture some of its beauty in our latest round of pocket sketchbooks. Starting with a photo of the table top, Brandon adjusted the color of the image to pull the grain into sharper contrast, ultimately converting this image into usable vectors for printing. The output is a stylized balance of wood grain and negative space that captures the beautiful natural contours of the slab. When it came to printing, Brandon wanted to create a look for these sketchbooks that was more unique than the previous round and evocative of the way the light dances across the grain of the desk. With help from the print team at Jakprints, we think the result turned out beautifully. 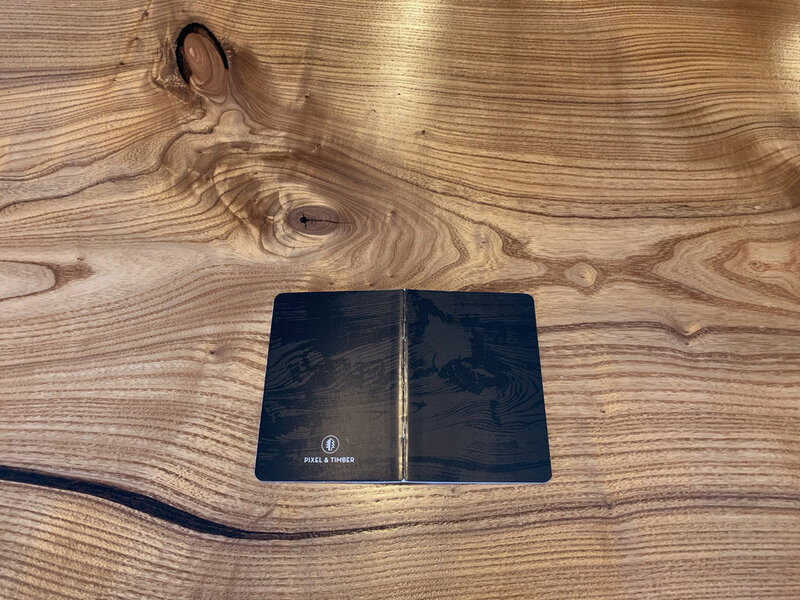 By using their “strike-thru matte varnish” the grain pattern was printed black-on-black, with the grain catching glossy reflections in the light. 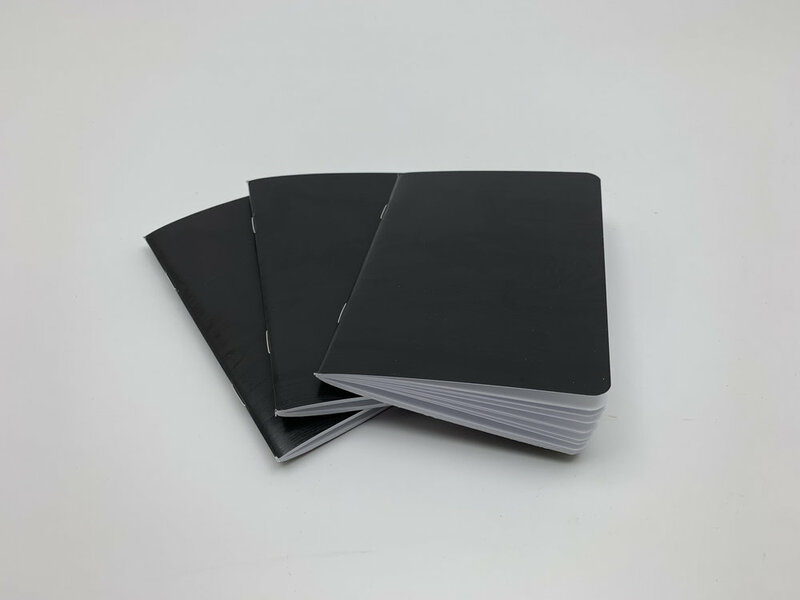 From a distance, these look like simple, black pocket sketchbooks, but upon closer inspection, they come alive with the details of the grain. Inspired by the desk around which we all work, we’re excited to share a small piece of the collaborative spirit that is the heart of Pixel and Timber with our friends and colleagues. Please use the form above to get one for yourself. Brandon’s design seeks to capture some of the rich natural contours and nuances of our desk. Inside the front cover, you’ll find a space to jot some relevant owner info. Inside the back cover, you’ll find a bit about ourselves and a handy ruler! After taking the sketchbooks into the photo studio, the contrast between the matte and gloss details become even more striking. At first, the sketchbooks appear as a deep, uniform black — but once the light catches the covers up close, the beautiful grain is revealed.